The 100 Stone project seeks to tell the story of mental health struggles and empower people to seek help from one another. Photo by Dean Swope/KYUK. 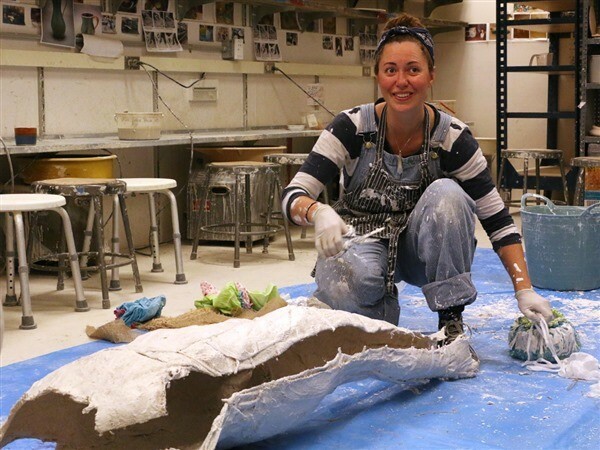 Sarah Davies is dressed in plaster-covered overalls and slathering the white, gluey substance on the 6-foot-4 frame of Chuck Herman in the art room at the Kuskokwim campus of UAF in Bethel. “At first it felt like they were just putting a big heavy wet blanket on me and then it started getting more and more constricting. So I feel pretty immobile at the moment,” said Herman. That’s a lot like what Sarah Davies says mental illness can feel like. She knows, as she’s struggled with physical and mental health herself, including depression, anxiety, PTSD and suicidal thoughts. “What that means is people who experience chronic illness, mental illness, which is a huge umbrella, grief, persistent grief, suicide losses, addiction and substance abuse, trauma – those are emotional burdens that may be like the weight of a bull on our shoulders, which is what the unit of weight 100 stone represents,” said Davies. Davies is leading the project, called 100 Stone. This is the very first casting session off the road system in Alaska. It’s a public art installation of 100 stories of personal struggles with mental health. Alaskans suffer at rates well beyond the national average in several mental health categories. Davies wrapped Herman in plastic, burlap and plaster. It’s kind of like a cast for a broken arm or leg, but for the whole body. Davies has already completed about 80 body-castings on the road system. The aim of the project, she says, is to transform cultural attitudes and approaches toward those who struggle with mental health. “Suicide awareness is one of the effects of what we are doing. What this is truly doing is speaking a truth: that we are here and we are suffering, and we are hiding in plain sight, and it is an isolating experience, and it is within that isolation that we find ourselves most at risk for things like suicide,” said Davies. The YK Delta region has high suicide rates, especially among Native youth. The Yukon Kuskokwim Health Corporation confirms nine suicides in the region this year, four of them in Bethel. Herman, who works with youth as a high school career counselor in Bethel, and is a member of the Bethel City Council, says he hopes to put the issue out front. “Anything that raises awareness of mental health issues is obviously an important thing, especially in the U.S. in general, and then in this community with all the issues we’ve had, and continue to have, around mental health,” said Davies. Davies plans to display all of the life-sized human forms from across the state on the Anchorage mudflats in December. They’ll be positioned walking into the water. Like the uncertainly of mental illness, the dramatic tides of Cook Inlet will wash some away. “We expect some will be lost, and that matches our experience in the world. We expect some will remain, some will be recoverable but perhaps unrecognizable,” said Davies. Davies says the scene will deliver a critical message of hope to Alaskans. “The important truth there is that isolation and shame is what puts us at greatest risk and that when we can see each other in that special way, that part that we try to hide, that’s where we find the light,” said Davies. Davies cast six bodies in Bethel to add to the project. She has about 20 more castings to do in other bush communities to reach her goal of 100.